Last weekend JPMorgan Chase & Co., the largest bank in the United States, published a job opportunity for an associate at its New York branch. One of the requirements was an, “opinion on bitcoin and other cryptocurrencies.” The bank has since deleted the remark, but the Wall Street Journal managed to write about it before JPMorgan could delete it. According to Benjamin Lawsky, superintendent of New York’s Department of Financial Services, the cryptocurrency created “a virtual Wild West for narco-traffickers and other criminals.” Even Nobel Prize-winning Op-Ed columnist Paul Krugman asked himself in one of his weekly columns for the New York Times if Bitcoin isn’t just “evil“. 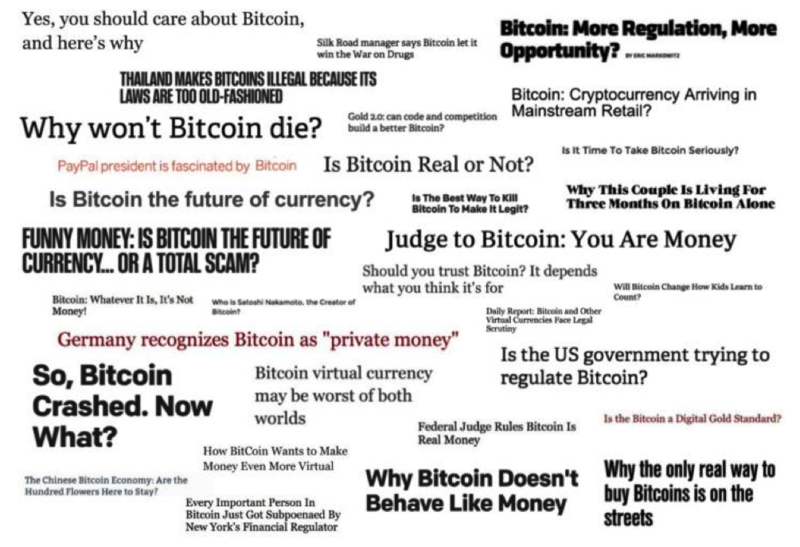 Nowadays the financial world is reconsidering their opinion about Bitcoin. In the beginning of September 2014 the Bank of England published a report that describes the blockchain — the distributed ledger of Bitcoin — as a, “significant innovation’ that has ‘far-reaching implications”. In February 2015 the Bank refined their opinion: “Creating such a system would entail creating a protocol for value transfer over the internet, akin to what Berners-Lee (1989) did for information.” It all reflects the thoughts of Oliver Bussmann, group chief information officer of Swiss bank UBS. The total service offerings of banks are stripped by the so called FinTechs. Or ‘unbundled’ as the VC’s from Silicon Valley like to say. Parts of the bank are turned into stand-alone products that are delivered to the consumer at a scale and cost that no traditional bank can match. The downside of this development is that banks loose their ability to manage customer experiences by themselves. 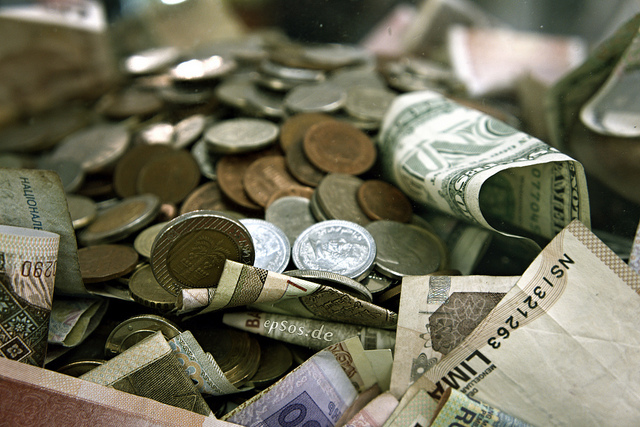 Banks are moving to the bottom of the value chain. Bottom up FinTechs meanwhile are threatening the market from a cryptocurrencies-point of view. They not only bring finance and technology together, but also reinvent the entire financial system. It’s a completely new network protocol that allows value to be exchanged without the need of a trusted intermediary. In this scenario banks hardly play a significant role anymore. All kinds of applications are now built on top of the Bitcoin blockchain. Smartphone apps that will make the underlying complexity invisible to the end users. In the near future transferring money and property will be as easy as swiping your finger from left to right. It’s beyond information on your fingertips, it’s exchanging value on steroids (without the need of a trusted party). Banks are now extremely worried that they are facing their own Napster moment – the point when the rise of a new platform disseminates a complete industry by offering a simplified experience in a cheaper way and at a scale that makes it impossible to compete with. His words started an explosion of FinTech-startups. Recent research shows that global investment in FinTech is set to double from $10 billion in 2014 to $19.7 billion in 2015. By 2020, the total is projected to be $46.1 billion. The FinTech scene is so hot, it’s boiling. And if you just look at Bitcoin itself, the numbers are staggering as well. 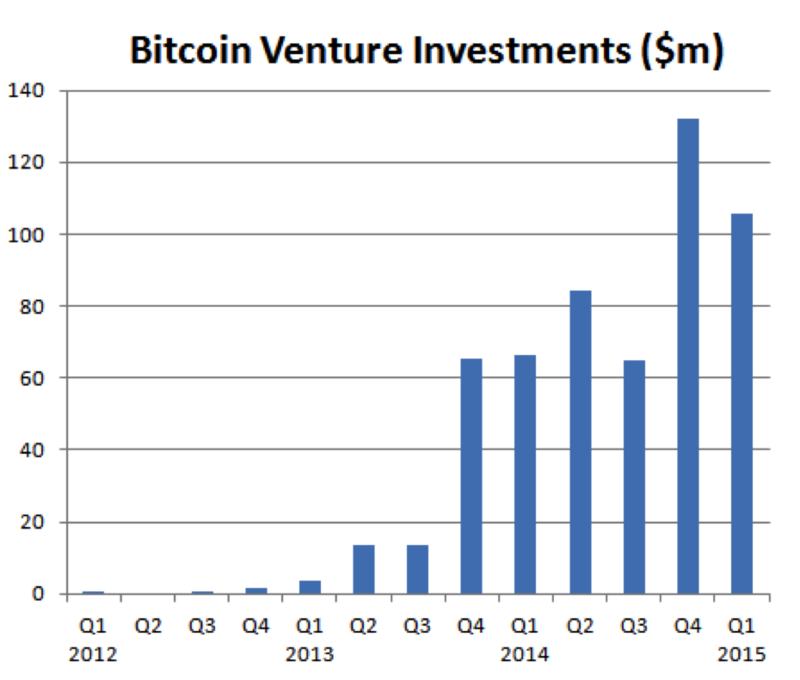 According to Coindesk, Bitcoin startups raised just $2.13 million in 2012. The figure rose to $95.81 million in 2013 and to a stellar $347.29 million in 2014. 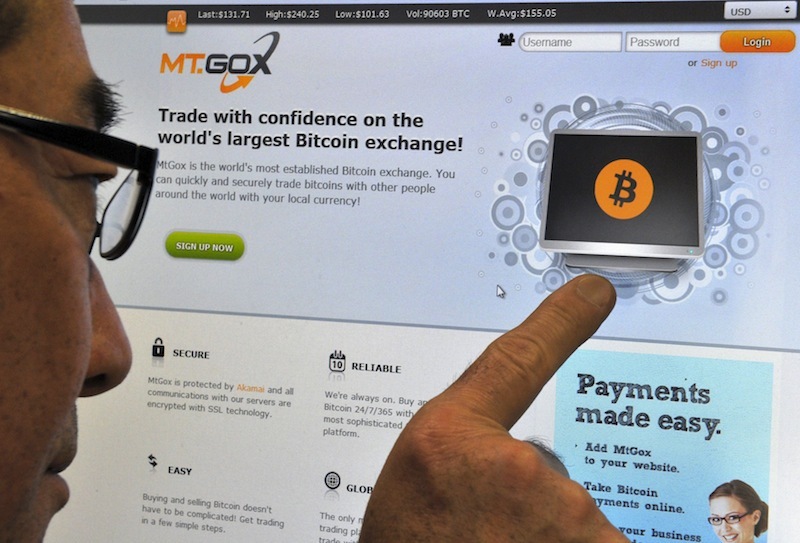 In July 2014 advisory firm Gartner added cryptocurrencies for the first time to their hype cycle of emerging technologies. 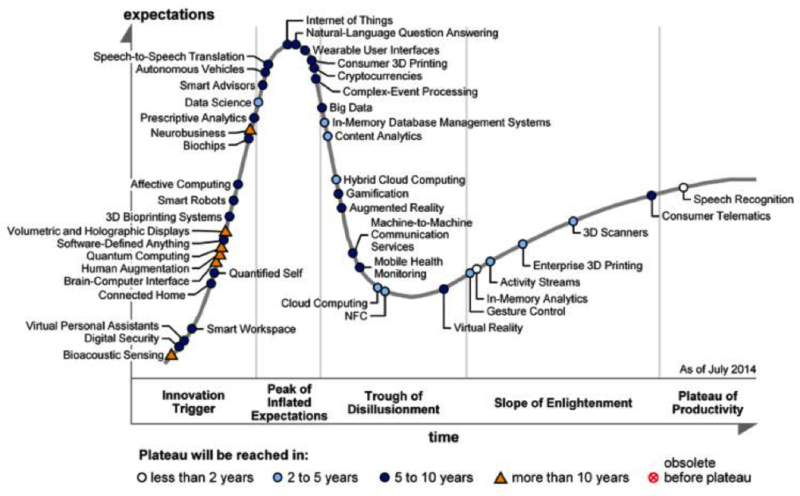 In the report they positioned the digital currency between the peak of inflated expectations and the trough of disillusionment. In their view the cryptocurrency needs another 5 to 10 years before it will be accepted. Peter Diamandis, cofounder of the Singularity University and coauthor of the books ‘Abundance’ (2013) and the recent ‘Bold’ (2015), doesn’t agree with this timeframe. In his view Bitcoin’s growth is best explained by an exponential curve and that’s why it is on a path to become disruptive over the next 1–3 years. 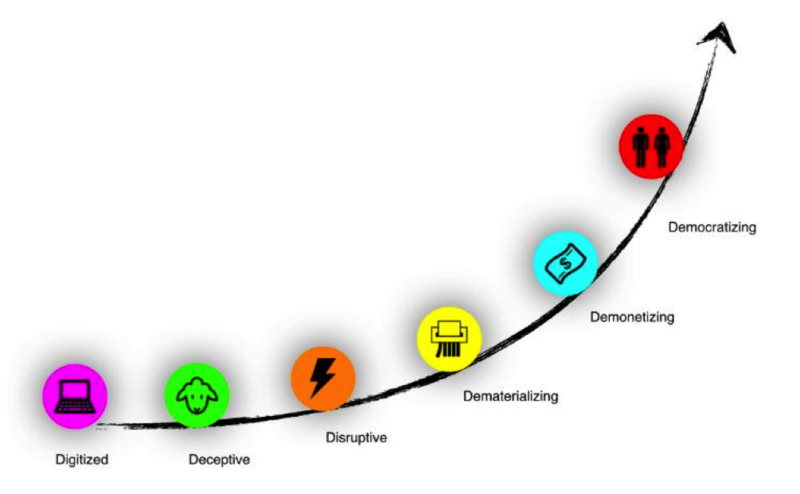 In the beginning digital technologies follow a linear path before suddenly growing exponentially. Diamands says that Bitcoin is following his framework of the 6Ds: Digitized, Deceptive, Disruptive, Dematerializing, Demonetizing and Democratizing. The cryptocurrency is now on a path from deceptive to disruptive and it will threaten the entire financial industry as we know it. In the next stages of his model Bitcoin is eliminating (dematerializing) the use of physical money and even credit cards, then it demonetizes the cost of transactions and consequentley will eliminate the need for middlemen (banks, lawyers, exchanges). Finally the last stage will be about banking the unbanked — capital and currency will become available to anyone with a connection to the internet (democratizing). Banks haven’t changed very much since their invention, thanks to Bitcoin they’re now dragged into the 21st century. It’s Digital Darwinism: adapt or die. No wonder that JP Morgan Chase has changed their opinion – and their job postings. By (quietly) recruiting new employees with knowledge in bitcoin, they are finally accepting the disruptive power of cryptocurrencies.